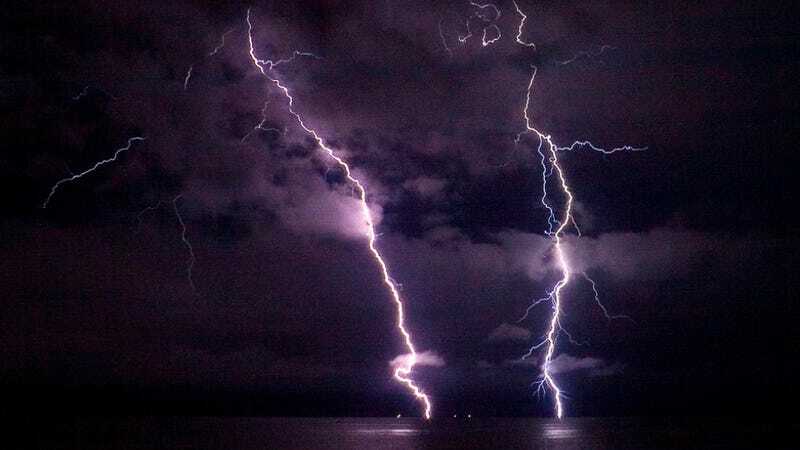 One exceptionally dangerous experiment is nicknamed "a lightning storm in a test tube." Although it does look like lightning, it's actually more like a bunch of booze-soaked explosions. Either way, it's cool to watch. Ah, what could be more fun that mixing acid, alcohol, and potassium permanganate? What's that you say? Shards of glass to the eye? Well, you're in luck. This experiment gives you a chance at both. If you want to miss out on the last, you should probably just watch the video of it. The setup is pretty simple. Just get a layer of sulfuric acid with a layer of alcohol on top of it. Next drop in the potassium permanganate. The potassium permanganate will trail down through the alcohol until it hits the acid. Once it's there, the acid will rip off its potassium atom, but gift it with a trio of oxygen atoms. Briefly. The newly-made molecule, manganese heptoxide, can't hold on to its seven oxygen atoms for long, and starts losing them two at a time. Oxygen bubbles up, and a lot of heat is released. When you have oxygen, heat, and alcohol, you'll soon get a lot of little explosions under the ethanol. Sometimes, however, you'll get one big flash as the "thunderstorm" becomes more of a test-tube shattering explosion. This is why, in general, only people with a lot of experience in chemistry and a lot of protective eye wear do this experiment.